Share the following quotes from President Thomas S. Monson, “Blessings of the Temple”. April 2015 General Conference. President Monson announced the building of 3 new temples. Where are they located? Find them on a map (a helpful online map is available here). Temple Math: 144 now open +13 being built+13 being designed+5 being renovated+3 new ones just announced=how many total temples? Which temple is closest to you? 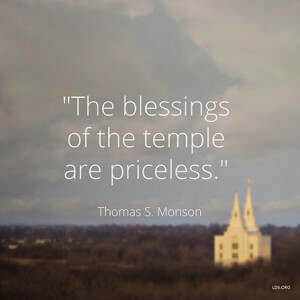 Which temples have we visited as a family (or have special meaning to our family)? Mom visited the Cardston, Alberta temple as a youth. Dad visited the Mesa, Arizona temple as a youth. We were sealed in the Salt Lake City temple. We attended the Provo, Utah temple while going to school at BYU. As a family we visited the Atlanta, Georgia temple open house in 2011. Dad, Mom, and Anwyn viewed the Fort Lauderdale temple dedication in 2014. Our closest temple is currently the Orlando, Florida temple. How can you prepare to go to the temple after you turn 12?